Our recent run of unbeaten league games came to an abrupt ending this afternoon after we were comprehensively beaten by three goals to nil as visitors Livingston became the second team to leave Palmerston with all three points in this seasons Championship campaign. With the incentive of moving into the top four on offer for Queens, there was much anticipation amongst the home support, but sadly on a cold damp afternoon there was very little to cheer about as unfortunately we were second best at almost everything. Following the midweek cup victory, two changes were made to the starting line-up with Jason Kerr, and James McFadden replacing Connor Murray, and Shaun Rooney, and there was also a change in formation as we began with a 4-3-1-2 set-up with Stephen Dobbie playing off the strike force of Lyndon Dykes, and Derek Lyle. An early free-kick offered us an opportunity to put the visiting defence under pressure, and when McFadden`s delivery from the right fell to John Rankin, although the Queens skipper caught the ball well, his effort flew well wide of the target. The long ball tactic was being used by both teams and only good covering by Jordan Marshall prevented De Vita from having a run at goal. The Livingston striker was in the action again moments later when his header forward led to an error from Darren Brownlie that was almost penalised by Mackin, but Alan Martin reacted quickly to block the striker`s attempt. 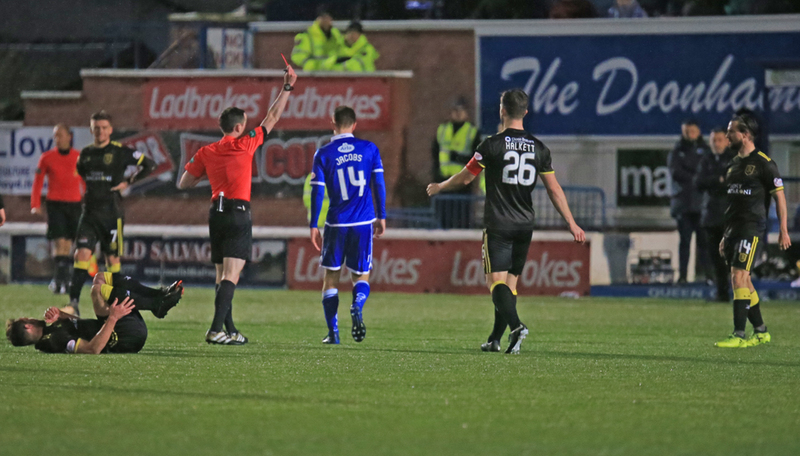 It took us 18 minutes to win our first corner following a McFadden long throw, but disappointingly the set-piece came to nothing after the referee decided that out of all the pushing and shoving taking place in the six-yard area, Queens should be penalised. The visitors were having plenty of success down their right where the particularly lively Mullin was having a big influence on the game - particularly with his crossing - and his driven low ball in to the near post was well gathered by Martin as Mackin looked for a decisive touch. 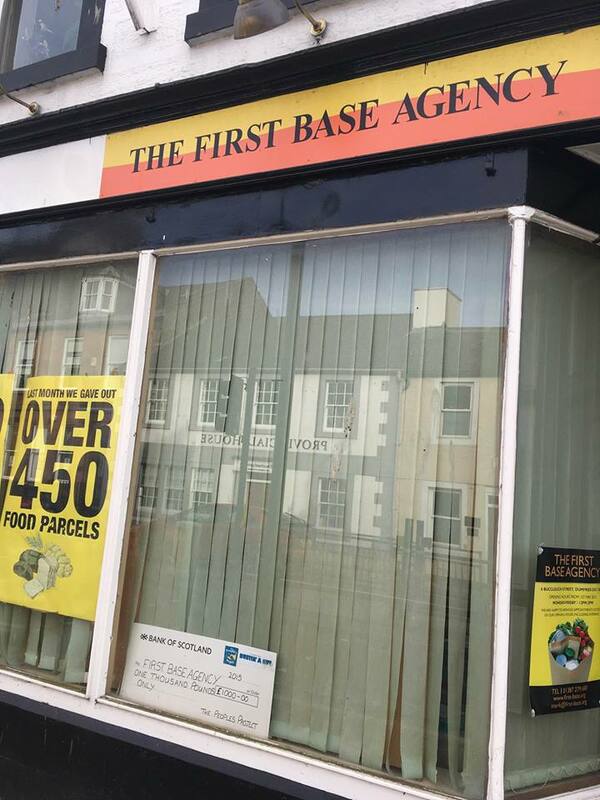 On the half hour mark we created our best opportunity of the first period when Callum Fordyce got to the bye-line and delivered a tempting cross that could only be half cleared to Derek Lyle and his first time low volley was well saved by `keeper Alexander. That was our first shot on target during the opening exchanges in a spell where once again too many of our passes were long and hopeful. At this point the contest between the two Jacobs brothers - Kyle, and Keaghan - was going the way of the Livingston man, as along with Pittman and De-Vita, they were having more control of the midfield area, and on 32 minutes De-Vita was instrumental in helping to give his side the lead. After being dispossessed in midfield, Stephen Dobbie was unable to cut off a pass to De-Vita on the right, and the Italian play-maker produced an excellent cross that found Penrice, and unmarked from 3 yards out, he swept the ball past a helpless Martin. With their tails up, the visitors pushed forward looking to increase their lead, and a clumsy challenge by Kerr presented them with a really good chance on 38 minutes, but if the set-piece was one from the training ground, let`s just say it certainly needs to be worked on !! The growing frustration amongst the Queens ranks was growing and Kyle Jacobs became the first player to be cautioned for a high challenge on Lithgow. With the half moving towards it`s conclusion, we finally had a concerted spell of pressure that on another day might have seen us rewarded. Firstly, Fordyce was once again able to get to the bye-line and pick out a decent cross and this time a Queens player was on the end of his delivery, but Lyndon Dykes could only get the faintest of touches to the ball and only succeeded in glancing his header wide of the far upright. 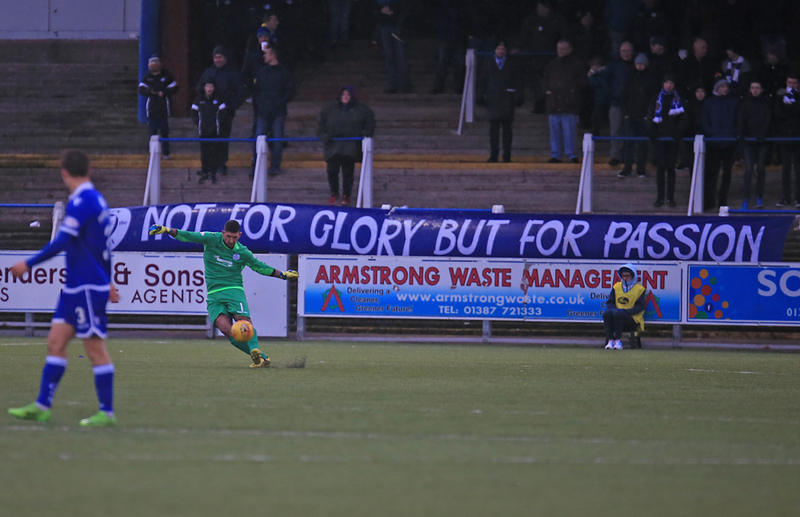 Then our final, and probably best chance of the half fell to Lyle however his firm header from McFadden`s cross from the left led to `keeper Alexander producing a fine save that kept his team ahead at the interval. There was no change in personnel at the break, but we did change formation as we switched to a more familiar 4-4-2 set up, with Lyle and Dobbie leading the attack, and instantly there seemed to be more energy about our play as we went in search of an equaliser. A long free-kick from Rankin was headed into the path of Kerr by Brownlie, but his centre-back partner was not quite able to reach the ball and the chance had gone. There was no doubt that Queens had started the half on top, and McFadden showed a tremendous burst of pace to catch what appeared to be a wasted pass, and when his cross on the run found the head of the on-rushing Derek Lyle it seemed as though Queens had found the leveller, but `keeper, Alexander dived to his right to produce a smart stop to keep the striker`s header out. Unfortunately we were not able to find a way past Alexander and his defenders, and as the half progressed, the visitors gradually grew into the game as s we began to revert to more long, hopeful balls that were easily defended . The frustration was growing more minute by minute and it could have got worse just past the hour when it looked as though Livingston had doubled their lead. A free kick from Mullin in from the right was headed toward goal by Gallagher and as Martin juggled with the ball to try and keep it out, it did appear that the ball had crossed the line, however, no goal was given and play resumed. Queens then made their first change when Chris Kane replaced Derek Lyle, and the first thing the substitute had to do was watch from afar as the visitors increased their advantage. The earlier decision not to award a goal could have had a bearing on the game but it proved to be insignificant as almost straight away and from an identical position, Livingston did score again. Mullin again delivered a really precise cross and this time Mackin`s touch sent the ball high into the net. It could and should really have been three for Livi minutes later as the Queens defence was carved open, but not for the first time in the game, Alan Martin saved well to at least keep the score down. The scorer of the second Livi goal had certainly had a busy afternoon causing the Queens defence all sorts of problems, some legal, some certainly not, and after a spell of persistent fouling, he was eventually booked for a lunging foul on Marshall. 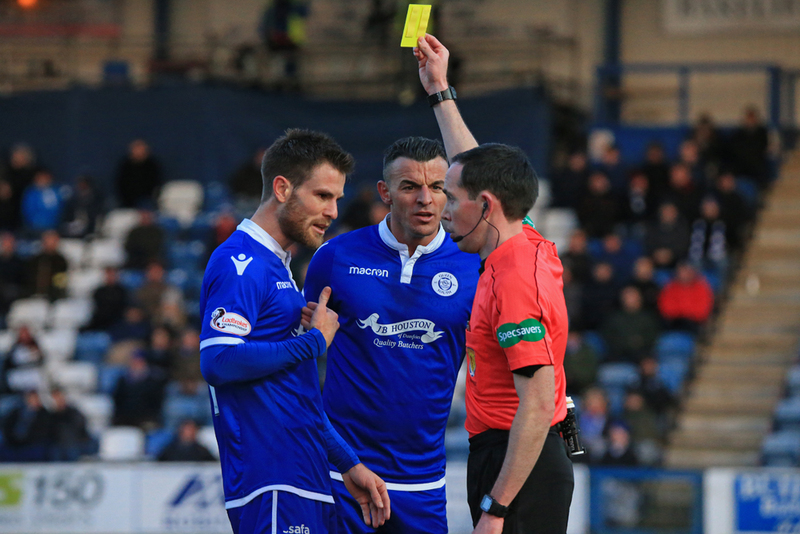 Shaun Rooney replaced John Rankin after 71 minutes, and then 6 minutes later we were reduced to 10 men when Kyle Jacobs late challenge on Lithgow saw him earn a second yellow, which then became red. It was a poor challenge from Jacobs and quite why he committed that sort of challenge having already been booked was hard to understand. The final few minutes were more about how many goals the visitors would score as we struggled to keep them at bay and on 81 minutes Gallagher, and one of the substitutes, Longridge combined well to create a chance for Byrne to drill home a third . By this stage the vast majority of the home fans in the crowd of 1328 were already making their way out of the ground and the only other notable things they missed was a poor challenge by McFadden that earned him a booking, and the late substitution of Dobbie, replaced by Callum Tapping for the final few minutes. On what was really a very poor day at the office, Alan Martin was named by the sponsors as the man-of-the-match, in a game where sadly for Queens, we were second best all round. 14:40 Livi; Alexander, Lithgow, Halkett, Gallagher, Byrne, Pittman, Penrice, Jacobs, Mullin, De-Vita, Mackin. 14:41 Subs; Maley, Cadden, Knox, Carrick, Todorov, Longridge, Henderson. 14:51 Two changes for the Doonhamers this afternoon. James McFadden and Jason Kerr come in for Shaun Rooney and Connor Murray, who drop to bench. 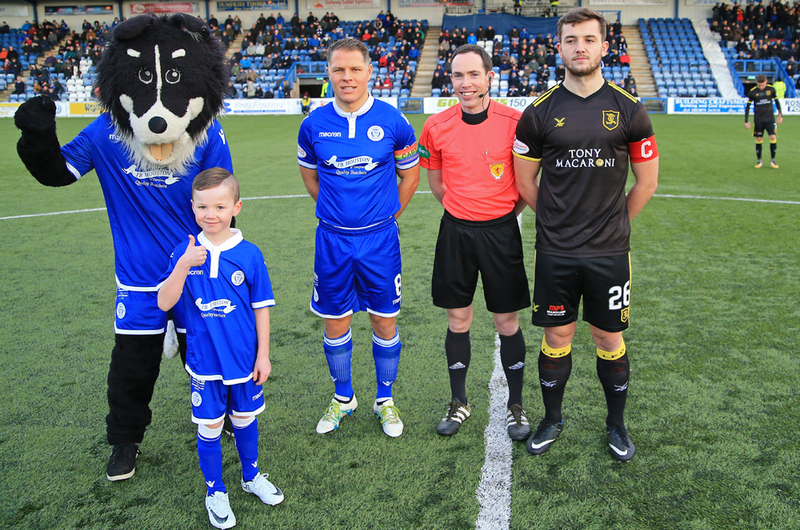 15:00 Teams are out and we`re only moments from kick-off here at Palmerston. 4 min Game stopped at the moment as Byrne receives treatment for a head knock. 5 min Rankin tries his luck from 35 yards but goes wide of the target. 6 min McFadden wins Queens a corner but the ball is cleared. 15 min De-Vita`s shot is blocked and Martin comes to collect. Still 0-0 here. 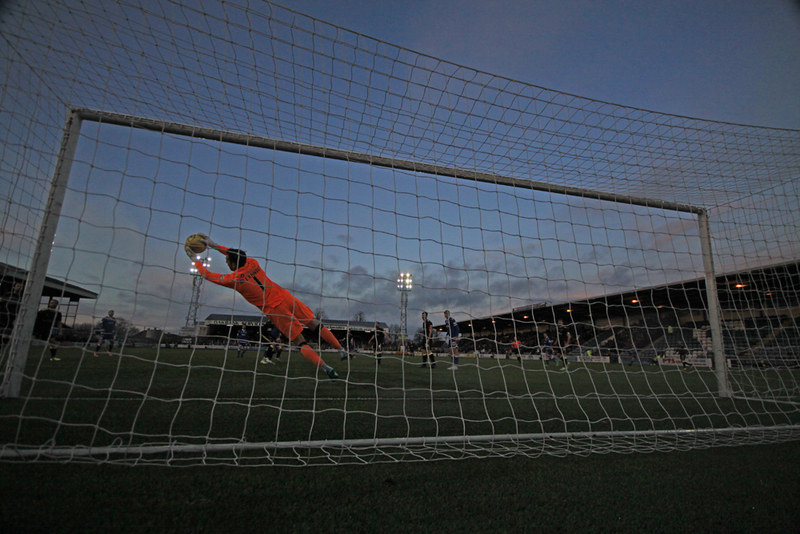 16 min Brownlie`s mistake opens the chance for Mackin but out comes Martin and makes a superb save. Let-off for Queens there. 19 min Mackin`s shot is well saved by Martin. 25 min A fierce delivery from the right is collected by Martin. 31 min Lyle`s shot is saved by Alexander. 33 min De-Vita beats the offside trap to get a touch onto Byrne`s cross and give the visitors the lead. 34 min Penrice the scorer for Livingston. 43 min Jacobs booked for a challenge on Byrne. 45+1 min Lyle`s header is superbly saved by Alexander. So close to levelling. 51 min Brownlie`s header across goals find Kerr but he can`t head on. 53 min Alexander tips Lyle`s header wide. Queens on top now. 63 min Martin just about stops Livi doubling their lead. Still 1-0 here. 70 min Mackin`s awarded Livi`s second. Big hill to climb for Queens now. 72 min ANother chance for Queens but Alexander makes another save. 77 min Jacobs sent off for a his second bookable offence. 84 min Livingston made their man advantage count as Byrne seals the points for the Lions. 85 min Queens win a corner. 86 min Brownlie`s header is caught by Alexander.